Copyright © 2013 Projestine Muganyizi. This is an open access article distributed under the Creative Commons Attribution License, which permits unrestricted use, distribution, and reproduction in any medium, provided the original work is properly cited. Since about a hundred years ago when SCD was formerly reported, there has been very marked progress in terms of screening, diagnosis and care . Africa, particularly sub-Saharan Africa is the most affected with more than two thirds of all the 300,000 annual SCD deliveries happening [1,2]. Despite of this burden, the management of SCD during childhood has lagged behind such that an estimated 50% - 80% of SCD children in Sub-Saharan Africa die before cerebrating their fifth birthday. This situation is in sharp contrast to what is happening in countries with good standard of care where on average the life expectancy of SCD is at least the mid-50s [3,4]. Following this situation and the lack of reliable obstetrics registry databases for Sub-Saharan African countries, there has been scanty literature on SCD in pregnancy. Internationally, SCD is associated with increased perinatal losses, maternal morbidity and mortality. The most commonly mentioned complications include spontaneous abortions, premature labor, fetal growth retardation, low birth weight, delivery by Caesarean section, infections, thromboembolic events, hypertensive disorders, hemorrhages and retained placenta [5-13]. Most studies seem to agree on increased adverse fetal outcomes but there is a wide discrepancy on the occurrence of maternal complications among studies. An increased risk of pre-eclampsia and pregnancy-induced hypertension have been reported in some studies [6,14] but denied by others [5, 10,11,15]. Likewise increased risk for hemorrhage in SCD pregnancy and maternal mortality have been reported by some studies [5,7,16-18] but not all [6,10-11, 13,15]. The above findings conclude that adverse perinatal and maternal outcomes are significant in SCD. The results also underscore the importance of understanding the local standards of care when interpreting the results. Impressive outcomes of SCD in pregnancy are not limited in high income countries. Some studies have reported impressive SCD delivery outcomes in low resource countries as a result of improved quality of care as the case of Benin and Jamaica [7,18]. In more recent years, improved childhood illness management and survival have been reported in Sub-Saharan Africa. In Tanzania, infant deaths have decreased from 106 per 1000 five years ago to the current 81 per 1000. This study utilizes data from electronic database in a tertiary hospital in Tanzania to determine the incidence and determinants of adverse pregnancy outcomes among SCD deliveries. This study focuses on the incidence of adverse outcomes occurring in SCD deliveries that took place in Muhimbili National Hospital (MNH) from January 1999 to December 2011. All the women and implicitly their babies were followed from admission due to a confirmed labor until maternal death or discharge. Data from antenatal cards, midwifery registers, admission books, case notes and maternal death audit reports were entered into electronic database for all deliveries. Electronic obstetric database at MNH was established in 1998 and has been continually entering obstetric data to-date. This database runs quality checks regularly by the internal and external (collaborating) experts. Using this database we analyzed the outcomes of all SCD deliveries during the study period. Adverse outcomes were defined by the diagnosis of anyone of these; low APGAR at five minutes (Score less than 7), delivery of a stillbirth, delivery of a low birth weight baby (less than 2.5 Kg), presence of postpartum hemorrhage (blood loss ≥ 500 ml), and the occurrence of maternal death. The presence of any one of these five outcomes confirmed the diagnosis of adverse pregnancy outcomes. 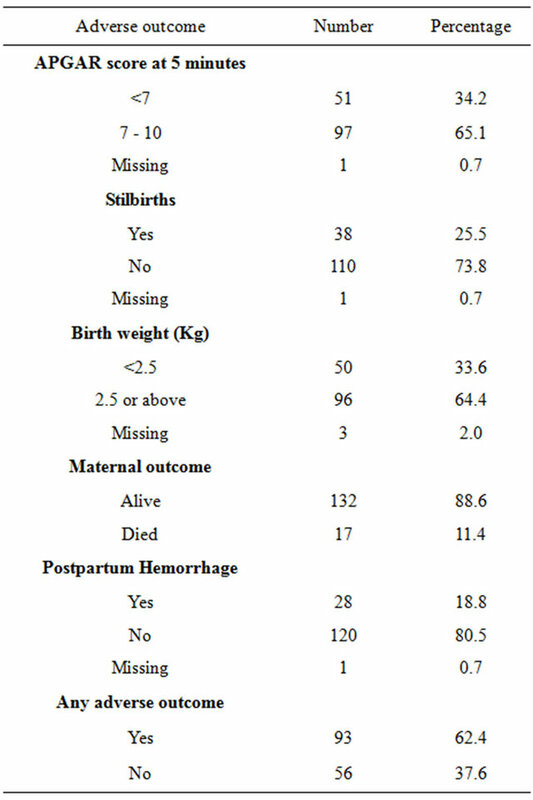 Independent variables included maternal age, referral status (whether came direct from home or referred from a health facility in labor), parity (including the just delivered fetus), gestational age, previous history of stillbirths, number of antenatal visits and mode of delivery (vaginal delivery or Cesarean section). We performed bivariate logistic regression analyses to establish the association of individual independent variables with adverse pregnancy outcomes. Independent variables with a P-value equal to 0.5 or less on bivariate analyses were entered in a multivariate logistic regression model in order to determine variables that were independently associated with adverse pregnancy outcomes. In all statistics, p-values less than 0.05 were taken as significant. This study was ethically approved by the Research and Publications Committee at Muhimbili University of Health and Allied Sciences (MUHAS) and the permission to conduct the study was granted by MNH authorities. A total of 157,473 deliveries were conducted during the study period of which 149 were by SCD. Out of these 149 SCD deliveries, adverse outcomes occurred in 93 which makes an incidence of 624 adverse pregnancy outcomes per 1000 SCD deliveries. Low birth weight and birth asphyxia were the most frequent adverse outcomes that occurred in 33.6% and 34.2% respectively (Table 1). Table 1. Rates of adverse pregnancy outcomes among SCD deliveries at MNH, 1999-2011. SCD deliveries that were complicated with adverse pregnancy outcomes had significantly more referred women (37%) than those SCD deliveries without adverse events (12.5%), p = 0.001. 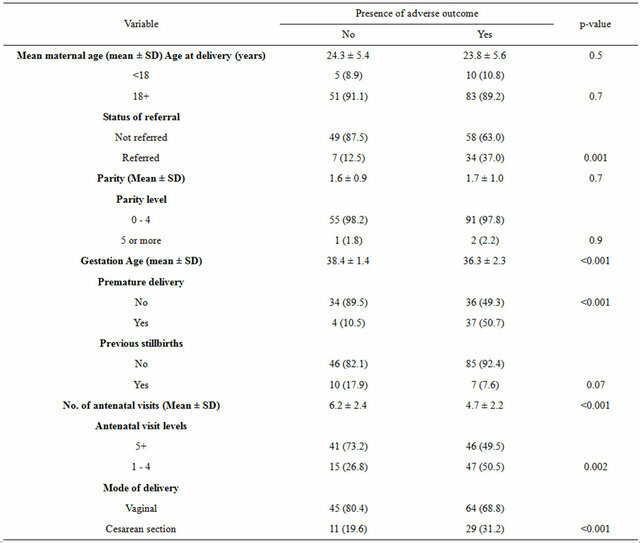 Likewise SCD deliveries with adverse pregnancy outcomes had lower mean gestation age and number of antenatal visits but higher prematurity and cesarean section rates (Table 2). Six independent variables qualified and were entered in multivariate regression model (Table 3). Three variables emerged to be independently associated with adverse pregnancy outcomes among SCD deliveries. These variables include the status of referral, gestation age at delivery and mode of delivery. The risk of developing adverse pregnancy outcomes was more than four times when the woman was admitted from a referring hospital compared to when she arrived from home. The risk of adverse pregnancy outcomes was more than halved (60%) as the gestation age increased by one week. Table 2. Stratified analysis of independent variables according to presence or absence of adverse pregnancy outcomes. Table 3. Bivariate and multivariate logistic regression analyses for determination of adverse pregnancy outcomes among SCD deliveries at MNH. In the current study low number of antenatal visits, low gestation age, delivery by cesarean section and admission through a lower level hospital were all associated with adverse outcomes. These variables may be seen as proxy indicators of prenatal care (antenatal visits, mode of delivery and referral) or prenatal fetal condition (gestation age/prematurity). Studies have shown that women with SCD in pregnancy seek prenatal care services more frequently than the non SCD [5,7] but to what extent these services help them largely depends on the quality of offered services. In Benin, for example, the observed excessive adverse pregnancy outcomes among SCD deliveries were very markedly alleviated with the introduction of a better standard of care . In the current study the importance of antenatal visits made by SCD mothers in reducing adverse outcomes was seen on a bivariate logistic regression but was lost after adjusting for confounders suggesting that the mere frequency of antenatal visits is insufficient to improve SCD pregnancy outcomes if a more comprehensive standard care is not implemented. Thus, meticulous antenatal care is needed if antenatal visits are to be consistently effective in preventing adverse delivery outcomes . The referral status of SCD women was associated with adverse pregnancy outcomes. Women admitted in labor at a tertiary hospital after care in lower health facilities were more than four times likely to end up with adverse pregnancy outcomes as compared with those admitted directly from home. Unlike antenatal visits, the risk associated with referral status persisted independent of other factors. The likely explanation for this could be a bias towards referral of more severely sick women from lower level health facilities as is the experience in other tertiary hospitals in Africa . In countries where care of SCD in pregnancy is standard, delivery is conducted in centers where comprehensive services for the mother and newborn can be readily available in order to minimize complications. A four-fold risk associated with Cesarean delivery as compared to vaginal delivery was also noted independent of other factors. Studies elsewhere report increased Cesarean delivery among SCD [8,20-21] and the disease is not considered a contraindication for this mode of delivery. The increased risk for adverse pregnancy outcomes in the current study could be explained by the limited attention paid to anaesthetic selection with a preference of general anesthesia rather than regional analgesia in the study setting. SCD patients have increased risk of end organ damage thus being poor candidates for general anaesthesia and Pethidine which is linked with seizures . Likewise, in the absence of a guiding protocol, it is unlikely that perioperative management in SCD can be of the standard expected to reduce the consequences of surgery . At MNH the use of regional analgesia for Cesarean section has evolved in the past decade from very low use of regional analgesia for Cesarean section in early 1990s to the current situation where only a few exceptions receive general anaesthesia. Unfortunately, data on other factors that are related to surgery and could impact negatively on SCD outcomes such as poor perioperative management and sepsis were not available to control for. All these inefficiencies could have contributed to poor delivery outcomes of mothers delivered by Cesarean section at MNH. An increase in gestation age was associated with a reduction in the risk of adverse pregnancy outcomes. Our findings also suggest that prematurity was associated with increased risk for adverse events. Both these findings could be anticipated since our composite adverse pregnancy outcomes variable included low birth weight component. Low birth weight is the most consistent finding in studies that have addressed fetal outcomes in SCD [4-10,12,13,16,21,23]. Its persistence even in settings where SCD management in pregnancy has been standard shows how difficult it is to prevent. This study has several limitations. The use of recorded data denied the flexibility to use all the desired information such as socio-demographic, intrapartum and postpartum care data to enable us to control for most of the desirable variables. Some variables had incomplete data necessitating dropping some of them. The diagnosis of SCD was based on the prior diagnosis usually made in childhood; hence it was not possible to sub-group the patients into their genotypic categories of SCD which would have been more informative. Nevertheless, the 149 SCD deliveries in the current study is one of the largest series of SCD in this sub region and has provided insights on the adverse pregnancy outcomes associated with the problem. Future prospective studies should be able to solve the limitations encountered in this study. I wish to acknowledge the assistance from Dr. H.Kidanto in his capacity as the in-charge of the obstetric database at MNH.